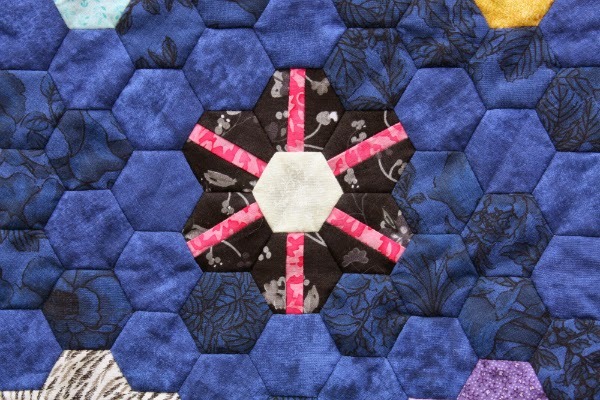 Devoted Quilter: TGIFF - The EPP Hexagon Edition! Welcome to Thank Goodness It's Finished Friday! I am so happy to finally be able to share this finished quilt top. This epp quilt top has some 1,340 hexagons, each of them 7/8" on a side. The finished top measures -----------. Not long after I started making these flowers, I won a copy of Mickey Depre's Pieced Hexies from Quiltmaker magazine. I loved Mickey's designs and quickly made 9 to add to this quilt. You can read about my experience with piecing my hexies. The pieced hexie flowers are some of my favourites. And here are some of the many regular hexie flowers. Altogether there are 56 flowers. I'm thinking that over the winter it may feel quite nice to sit under a warm quilt and indulge in more hand stitching. And besides, epp isn't exactly a fast method of making a quilt top, so slow quilting will certainly fit with the theme. So, I am now almost convinced I will hand quilt it, though I haven't decided what exactly I will stitch. Any suggestions? It feels so different now that all the papers have been removed. It's so much softer and more flexible. 1,340 papers make for a rather impressive pile, don't you think? The mug and the thread are just for scale. Now it's your turn. What are you excited about finishing? Link it up and share! Don't forget to visit a few of the other links and offer your congratulations for their finishes too. Wow, it's beautiful, Leanne! 1,340 hexies?! Whoa! Thanks for hosting this week! Oooh that's a lot of work!!! thanks for hosting! Wow, that is an impressive amount of work. 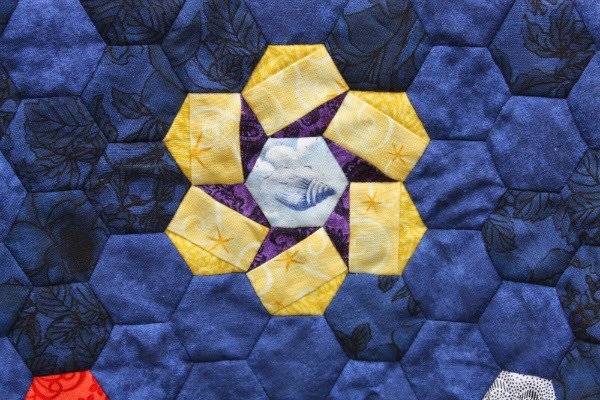 The pieced hexies are fabulous, but the whole is just absolutely stunning. I like your use of a deeply saturated background color. Well done! Incredible piece, Leanne! So much work and sew many hours! And it has turned out gorgeously! Love the two tone background. It really makes the flowers pop! I can understand you not wanting to hand quilt this after spending so much time with it already, and myself would be tempted to do a edge to edge quilting with the walking foot, but it really would look great hand quilted for a more traditional feel. Can't wait to see what you decide!!! Wow! This is amazing, that is a lot of hexagons. Best of luck with the quilting! 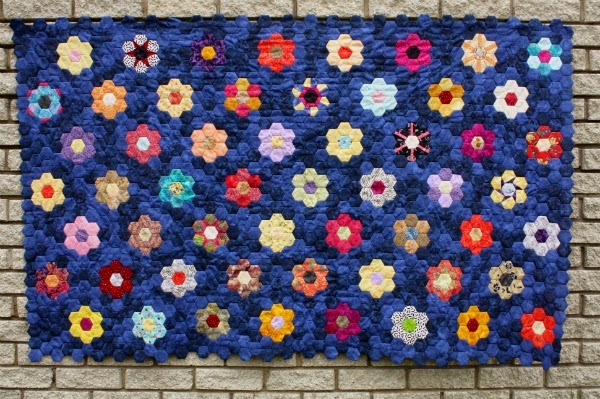 What a gorgeous hexie quilt! I am amazed!! 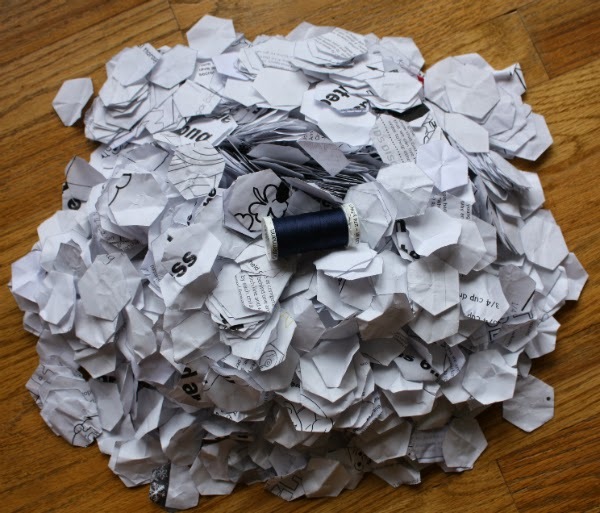 And how neat to see that pile of paper hexies... This is inspiration to try something a little bigger with hexies . WOW!!! It looks AMAZING! I know you are so proud of if! That is incredible. I don't see myself ever having the patience to take on a project like that! Well done. All those teeny tiny pieces...... Yikes! Great work! I am amazed by the pile of papers! Whoa! This is awesome! 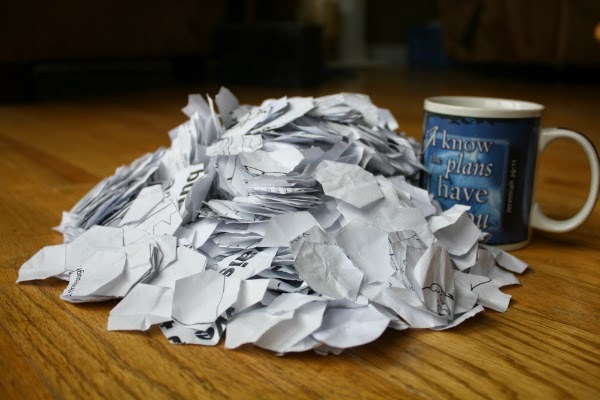 And I love the big stack of paper! Congrats on your finish! That's a lot of hexies. Incredible! You finished it!! Yaay!! It looks absolutely stunning! Hand quilting would be so wonderful. What a beauty! I love the flowers with little added details. Hand quilting would be perfect, but that's easy for me to say since I don't actually have to do it. It's a beauty! Hand quilting would be so great and look fantastic. 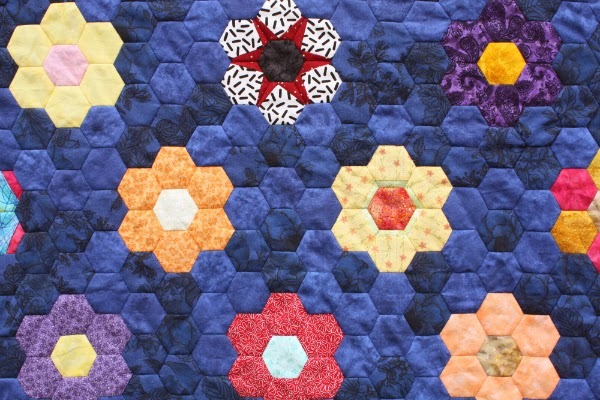 This hexagon quilt is a treasure. I love, love, love that the blocks are made with unique patterns in them! Gorgeous! It is a beautiful quilt Leanne and I agree with hand quilting, winter does seem the pefrect time to do it. Such an amazing piece, you won't regret the extra time for the hand quilting. Oh what a fabulous quilt! I love hexies and this one is so beautiful. I love all the variations you used in piecing your hexies. 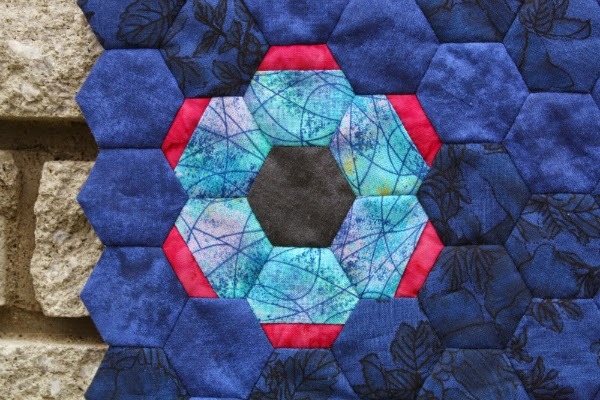 I invite you to link up to Hexie Weekend to share this lovely, ends today, midnight.